Pachmann article: "Pachmann Preaches Economy of Motion" by Jacob Eisenberg. 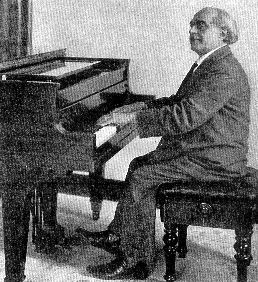 An Authority on the "Weight and Relaxation Method of Piano Playing" Interviews Veteran Pianist and Learns More About the Famous "Methode"
Par 1 HAVING heard and read so much about Vladimir de Pachmann and his "methode" of piano playing, I was naturally anxious to know the whole truth about it. Among the many current reports and interviews, some referred to De Pachmann as advocating the employment of a stiff wrist in piano playing, while others credited him with advocating the use of a straight wrist. From all that was said of him and his ideas on piano playing, it was almost impossible to come to any coherent conclusion as to his real ideas or method. Par 2 I, therefore, attended his recital at Carnegie Hall and was more than favorably impressed by his performance besides learning a little of the truth with regard to his method. When a man has reached his venerable age and can yet display such remarkable technical facility — with such extraordinary ease and grace in his every movement — there must be something to his ideas and method that deserves widespread attention. To witness some performers at the piano one often wonders how it is possible to store up so much energy in one body as they expend in the execution of a single composition. To witness a performance, with De Pachmann at the piano, one is constrained to wonder if he expends any energy at all. His every movement is simplicity itself. I therefore resolved to meet the artist and observe more closely his method and hear him expound his ideas on piano playing. Par 3 When I called at his New York hotel he was most cordial and enthusiastic. Imagine my joy, sitting alone by his side for nearly two hours, listening to him play, hearing him explain everything he did, and observing all his movements at close range. After playing for almost two hours, he felt that he had only warmed up and was ready to play on indefinitely; there was no apparent strain or fatigue. He was as fresh as he was when he started to play. Par 4 His whole method of playing the piano may be summed up in a few words: — Economy of Motion which is embodied in the principles of Weight and Relaxation. Par 5 Leopold Godowsky knew what he was talking about when he said to me only a few weeks ago that the only method that enables the performer to attain the maximum of results with a minimum of effort is the Weight and Relaxation Method — a method he himself had discovered thirty-two years ago. Par 6 De Pachmann's playing helped further to prove that the only method that can be employed to develop ease, grace, quantity and quality of tone and sympathetic expression in piano playing, or in other words, every shade of tone as well as the sublimest quality of tone, is the Weight and Relaxation method. That is, he employs the weight of his body and arms for quantity and quality of tone and conserves his energy by maintaining relaxed muscles and practising economy of motion in his playing movements. The whole process and fundamental laws governing those principles are fully explained and the means of mastering those principles are contained in my books on the subect. I was indeed gratified when I saw all the principles that I endeavored to expound, being demonstrated so perfectly. Par 7 In speaking of his method he stressed the point that most performers work harder than is necessary to obtain the results usually obtained. The performer makes too many unnecessary motions in his playing. If every unnecessary motion and every unnecessary strain could be avoided or eliminated, the energy and time so consumed could be used to better advantage. Par 9 De Pachmann preaches economy of motion which must be accompanied by ease and grace in every movement. He religiously adheres to that principle. To bring his playing movements to an irreducible minimum, he resorted to the severe task of refingering all his compositions. If it will save a movement or a turn of the hand at the wrist, he will play a note of a chord or a passage with the left hand that had been originally designated to be played with the right hand. He has refingered passages, which are ordinarily played by the right hand alone, and plays them with both hands. For example, he played a chromatic scale for me, in which he played the white keys with the right hand and the black keys with the left hand. He said, "I did that thousands of times before I was able to do it so perfectly" and perfect it was. Par 10 Now with regard to his statement that one can not play all compositions by the employment of his method. He disapproves of a free side movement at the wrist. He claims that such movements consume too much time and energy and cause too much strain on the muscles that make such movements possible. He believes that every avoidable strain must be eliminated. Though his wrists are absolutely supple and can easily accommodate such movements with no ill effect, he believes that the hand at the wrist must be free from every unnecessary movement whether it is an exaggerated up-and-down movement or an exaggerated side movement. Though both these exaggerated movements should be avoided as much as possible it is hard to see how it can be entirely avoided. De Pachmann, however, overcomes that obstacle by saying that rather than permit exceptions to his principles, of reducing his playing movements to the irreducibIe minimum, he will not play a composition that necessitates such movements. Therefore, his statement that one can not play all compositions when employing his method. In other words, as he himself says, "Piano literature is so extensive that I can easily find scores of beautiful programs which do not require me to violate the principles of my Methode."